Thank you so much. I’m trying to work on my own childhood trauma and this explains why it is so hard to do so! I was so scared for so many years and I seem to have buried / separated the emotions that go with the memories but even finding the memories is hard because I guess I don’t really want to dwell there any more (sensibly). I know intellectually some of what happened but cannot engage and therefore cannot clear the present day fall-out of chronic auto-immune illness. I am a full time carer for my daughter who has trauma psychosis and BPD. This is very useful for me to help me understand the way she is. Please keep up the good work I truly appreciate it. I found this infographic really helpful, thanks. 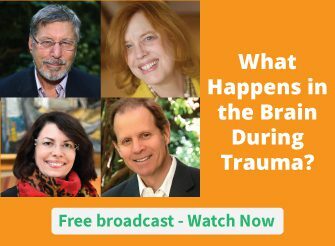 It’s good to be reminded of how trauma impacts different parts of the brain. Thank you for this great information. It explains our memory challenges so well. I am a survivor of 19 years of sexual, physical, emotional abuse, emotional neglect, and gas-lighting and public humiliation, by both parents. I am an ICF certified life coach, and I’ve done a lot of work with survivors of all types of abuse. This chart will be very helpful. As well, I am involved with, and committed to the Opening The Circle project here in London, ON, which is an emerging development of peer support. And, for the past 5 years I have hosted a “Learning & Support Group for Adult Survivors of Childhood Abuse” at the London Public Library, Central location. And, I have a close family member who thinks my messed up memory is simply an excuse. Will share with them too. I would like to get your permission to include this print out as a handout in a webinar I teach. I will obviously leave the copyright information there and provide the handout unaltered and inform participants that I received permission to share the handout. This is one of the lay-person friendliest handouts I have seen to explain impact of trauma on the memory. Thank you! You can email me personally regarding receiving permission. Hi. Thank-You for another informative Info-Graphic that explains how our brain functions and in what areas of the brain different types of memories reside. Very useful for my work with Relationship Issues, because one or both people in the relationship may have different types of traumas that impact the relationship. I can show this Info-Graphic to my clients so they can see that the brain stores memories in a variety of ways. Very helpful graphic and info to use with folks. I appreciate your work. Many thanks for sending the memory chart.Your work is really appreciated. Even in retirement I enjoy watching the webinars and learn from the extra material. I work with folks who have been traumatized often so this is very thought provoking as well as helpful. thank you! Thank you again,Ruth! This infographic will be extremely helpful to my clients’ understanding of how trauma has affected their lives. Dear Ruth – This graphic made my day; it’s brilliant. Please let us know if we may put it on slides to show at non-commercial educational events about trauma, with of course detailed attribution to NICABM. I’ll also mention when showing the slide that NICABM is the “go-to” source on trauma education. I’m co-founder of the Orange County California Task Force on the Adverse Childhood Experiences (ACE) Study, and what we do is public education on the widespread nature of trauma and the bio-medical blow-back. You, Ruth, personally and NICABM have certainly been my go-to source since my first Gold Subscription in 2011 and I’d also delighted with my subscription to the current Treating Trauma Master Series. I got so much earlier from watching one person like Allan Schore or Peter Levine just develop their thoughts for an hour, so I worried to lose that with your new format, but now I love it. Particularly Module 3’s segment on Procedural Memory is so mission-critical and you bring new insights to it, the way you pull everyone’s thoughts together. God bless you — I can’t stop watching this video! Thank you very much. This Trauma Series is awesome and I am very grateful to be the lucky recipient even though I am unable to invest on the tuition fee at this moment. 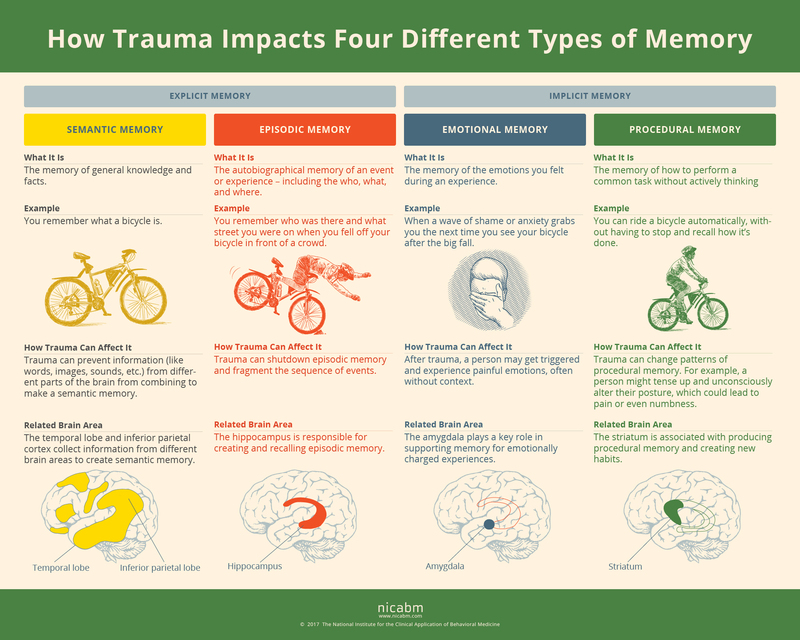 This memory infographic is wonderful, especially since I missed the last module on memory and trauma. And, most importantly, I will definitely use it to educate my clients who have experienced trauma. It will help to deepen the understanding of their own behaviors and symptoms and remove some of the shame and self-blame for their difficulties. Again, thank you! Thank you for making this information available, I can use this to explain to my trauma clients what is happening for them. The fact that this series is free is so beneficial, I am newly qualified and just can’t afford to pay the costs of most training modules. P.S. I’m on the west coast of Australia and it screens at 5 and 6.30am! I am really benefitting from the series…Thank You! Do you have someone could could refer to do this work in or near Marin County in Northern California? We have a friend who is in dire need of some professional help with grief and trauma; she lives near Sausalito, across the Golden Gate Bridge from San Francisco. It should be a very experienced pro. I am a counselor and educator. I have also had a major trauma in my life at age 6. Since then, the effect has had a major impact on my Implicit Memory, specifically, my procedural memory. I have a habit that I want to break free from as it has kept me from proceeding forward with my passionate career. I have been listening to your wonderful webinars and have learned a lot about myself. In order to help others, I want to get help. I would like recommendations of therapists in my area. Please email me personally. Thank you, Ruth. This has been an excellent program! Your efforts are tremendously appreciated. As a mental health professional who uses Brainspotting and EMDR techniques, this is very helpful in explaining to clients how our brain works. THANK YOU! Thank you so much for the excellent graphic. As a Speech Language Pathologist, I love the relationship of the various memories to language in helping children process information and express themselves. Thank you for this visual aid. I’m a yoga teacher & volunteer teacher with Frontline Yoga Inc., and working with first responders. This series gives me a deeper understanding of the impact trauma has on our frontline warriors, their families and those affected by trauma in my community. Thank you for the visual handout. This is not only helpful to me, but I can use it when I am educating clients about trauma and recovery. The visual suits my learning style, this is a great bonus learning tool. this particular series helped me accept my own trauma recovery with more understanding and acceptance. Many thanks Ruth. and your team. Thank you for sharing this very helpful tool! This is SO helpful for my clients. Having it as a graphic makes it useful as both an educational tool and as a therapeutic tool as it normalizes the experience. I live in an isolated area where training and workshops are rarely delivered and travel to larger city centres is expensive. I really appreciate the opportunity to learn about trauma and how it affects my clients AND how to best approach treatment for those impacted. The content of the webinars is the best I have experienced thus far in webinar based workshops on ANY topic. Thank you so much for this opportunity to grow my professional capacity conveniently and at no cost. You are providing a much needed service!! I don’t see anything about PTSD and suicide attempt survivors. We experience PTSD which is why it is so hard to get better from suicidality and its depression. Any interest in that? I would be happy to write something on it. I would love to take a look at it since it is a very interesting topic to me. I am not sure about the stats either so it would be intriguing to see the outcomes. Amazing! I don’t remember having some info like this for attachment types in relation to trauma. But thank you for the great graphic. Thank you for the helpful overview! I love watching the free broadcosts. They give me practical impulses in a stimulating teaching stile. Thanks you – super helpful! Would love to see more visuals like this – such a great educational tool! Thank you for your generous sharing. I’m sure I speak for many when I say that I appreciate the years of research, dedication, interest and time put into this entire body of work. Thank you, excellent resource. I love getting this information. Thank you so much for the info graphic. It will be very helpful in working with my coaching clients. Merci beaucoup Ruth ! C’est vraiment très généreux de ta part de nous faire parvenir de tels outils. Thanks Ruth . The pictures and comments make it very clear how the trauma affects different parts of the brain. It will be very helpful to explain to therapists and students the way my work Alexander Technique affects affects the brain in a positive way. I would like to talk to you more about this as research goes on I think Alexander is a great tool to help both therapists and clients work through Trauma . Anything I use will of course be credited to you and Nicam. Very helpful! Helps to connect all the various areas of the brain and the functions related to memory. I wish you had taught my college psychology classes. This is so straightforward and simple. Thank you so much. It is a great infographic. Brilliant ….. this resource will be invaluable. Blessings for creating and sharing it. Such useful tools for practitioners to show clients and discuss with them. Thank you so much. Lenora – long time since I’ve seen your name! This series is right up the street of Autogenic Therapists – we work through the body systems using Schultz-type practice, training people to calm body and clear mind, and many times trauma memories surface. Thank you for this very valuable tool and series. I love this Ruth! Thanks so much for all of the effort in creating this very easy to understand tool to assist in conceptualising the impact of trauma on memory. I am going to send a separate note to you directly in relation to your activities in Australia and my potential involvement. Many thanks and huge gratitude for all that you and the team at NICABM do for all of us i.e. the practitioners and the clients i.e. the navigators of PTS. Thank you, very helpful tool that explains what happens simply. Thank you. It is very informative.